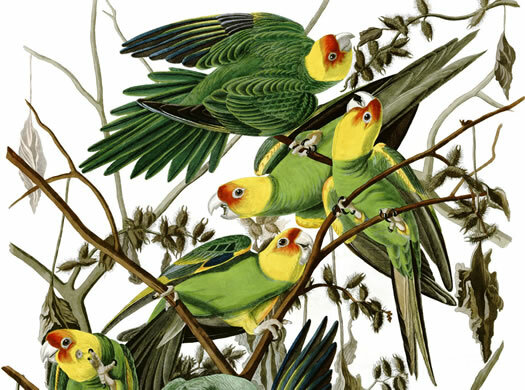 Jeremy Kirchman -- the State Museum's curator of birds -- has been studying the Carolina Parakeet in order to figure out where the birds fit on the parakeet family tree. The State Museum has four of the parakeets in its collection. Two of them are now on display in the lobby gallery. "They're unusal because they were the farthest north parrot in North America. It's unknown whether they were here year round, or seasonally," Kirchman told us today. He says the birds have been extinct for so long that there wasn't a chance to for them to be studied extensively. But Kirchman says scientists do know a bit about the birds' behavior -- and how that probably contributed to their downfall. "They were crop pests and they were gregarious, meaning they would form flocks. And if they descended on your apple orchard, you'd defend it with a shotgun." Kirchman says just as farmers hunted down and shot wolves that threatened their livestock, they also went after the parakeets for threatening their crops. Also part of their undoing: hats. One of the fashion crazes of the 1800s included people adorning hats with brightly colored feathers. And who had bright, beautiful feathers? Yep, you guessed it. "You certainly could have made money by selling shot parakeets to people making hats." Add in the fact that the parakeets' habitat was the forested area of river valleys -- just the sort of place humans were building cities -- and there were no laws to protect wild bird populations, and the Carolina Parakeet's days were numbered. By the late 1800s they were rarely seen outside of Florida, and were considered extinct by the 1920s. One of Kirchman's research areas includes ancient bird DNA. So when he got to talking with a friend who was studying South American parakeets, he saw an opportunity to research where New York's (once) native parakeet fit into the bigger family tree. He was able to extract DNA from the State Museum's specimens and compare it against the DNA sequences of the other parakeets. Five million years is a good run. It's just tough when it ends on a hat. As recently as just a few decades ago, other bird species in New York were in serious danger. Kirchman says the state had almost lost all its peregrine falcons, ospreys, and bald eagles. But environmental laws have made a signficant difference. "Because of tighter regulation on shooting birds and pesticides, a lot of those populations are doing better now," he says. 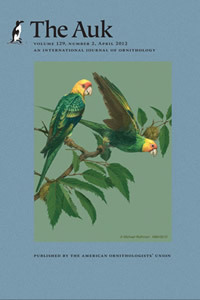 Jeremy Kirchman will be giving a talk about the Carolina Parakeet at the State Museum this Saturday at 1 pm. It's free. And, as mentioned, two of the museum's four Carolina Parakeet specimens are on display in the museum's lobby for the next few months. Kirchman says there are only a few hundred specimens of the birds remaining in museum collections. I see a flock of them in my neighborhood around wintertime , in Brooklyn. Miguel, you're not seeing Carolina parakeets (as, like the article states, they've been extinct for nearly a century) - more likely they are Quaker parrots (also known as monk parakeets), which have colonized several cities across the US, including Brooklyn. I wish the names of species that were the most closely related had been included. I suspect that the Sun Conure is one of them, Happy International Bird Day, May 4th.